FaceTime and Skype make it easier than ever to keep in touch with family, friends, and co-workers. However, video calling isn’t always convenient for everyone: Many folks still don’t have cameras connected to their computers, and many others don't want to. In these cases, consider sending a short video message to your favorite people—you’ll find that 30 seconds of video can convey much more emotion and nuance than any amount of text. The steps below assume you have a Mac with a built-in iSight/FaceTime camera, and are running Lion. (The sequence is very similar in Snow Leopard, though there are fewer choices and certain menu items are different.) The resulting video files created are in the H.264 format and designed to be opened on any Mac, iPhone or iPad, as well as most PCs. Open the QuickTime Player application and choose File -> New Movie Recording. A recording window will open, taking up a fairly large portion of your screen. Toward the bottom of this window, you’ll see a floating panel that includes a Record button smack in the middle. To the right of the record button, there's a small triangle that denotes a pop-up menu. Clicking the triangle lets you choose a different camera and microphone (if you happen to have more than one attached to your Mac) as well as the quality of the movie. Choose Medium for the quality, and the movie recording window will shrink to 640-by-480 (from 1280-by-1024) pixels. This will help keep the movie’s file size under control. Now drag the movie recording window underneath the iSight/FaceTime camera (look for the green light at the top of your display). 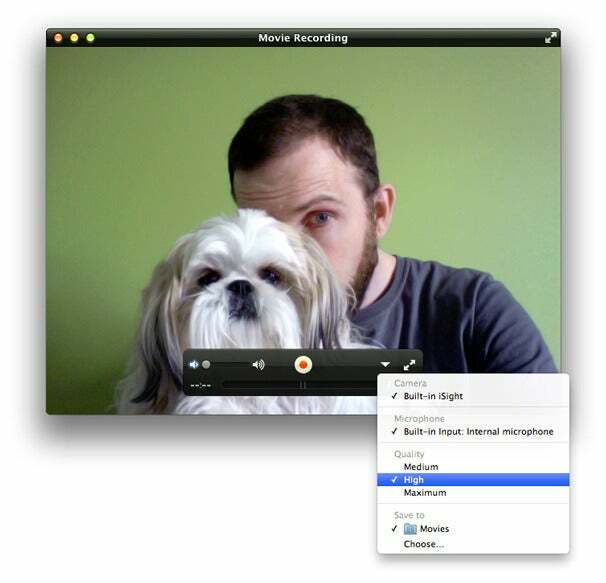 It’s natural to look at yourself when recording a message, and by placing the movie window near the camera, it will seem more like you’re speaking directly to your audience. When you’re ready, click the button to start recording. Don’t worry too much about awkwardness at the beginning and end of your clip—you’ll trim those parts in the next step. Try to keep your message between 20 and 40 seconds. The longer you record, the larger the file, and the more problematic it will be to compress and email. When you’re done recording your message, click the red button. The small triangle at the right triggers a pop-up menu that lets you choose the movie quality. Once you’ve recorded your movie, you can use QuickTime Player’s Trim command to pare down the clip, removing unnecessary, awkward silence from the beginning and end. Choose Edit -> Trim, and you’ll see the navigation panel (formerly the record panel) expand to show an overview of your entire movie. Simply grab the yellow tabs on either side and drag them inwards, placing them at the points you want the movie to start and end. You can preview the trimmed movie by clicking the play icon (on the left); if you’re happy with the changes, confirm them by clicking Trim (on the right). The first option is to use QuickTime Player’s direct export to Mail. In Lion, Choose Share -> Mail. An export form will slide into view, and ask you to choose the export size. Click 480p to limit the data rate to 2 Mbit/s and then click Share. In a few seconds, Mail will automatically open a message window for you containing the video. Simply fill out the address field, enter a subject, and perhaps a short message, and click Send. (Concerned about the file size? Command-click the movie and choose View as Icon. You’ll then see the file size to the right of the file name.) While this sequence works well in Lion, however, Snow Leopard does not have a direct export to Mail feature. The Export for Web command allows you to quickly save your video message at different sizes and qualities. The second option is for longer messages and is best used with Snow Leopard. Choose File -> Export for Web (Save for Web in Snow Leopard). Give your movie an appropriate name, save it to your Desktop, and click Export (or Save in Snow Leopard). Now, locate the folder on the Desktop that bears your movie's name. Inside, you’ll see a folder called Resources, and within it, three m4v files: Broadband, Wi-Fi, and Cellular. (Snow Leopard offers only Computer and iPhone choices.) In List View you’ll see the size of each file. Typically, Wi-Fi offers the best compromise between quality and file size, so drag that movie file onto your Mail app icon. This will open a new message window containing the video; now just fill out the address and subject fields, compose a short message, and click Send.